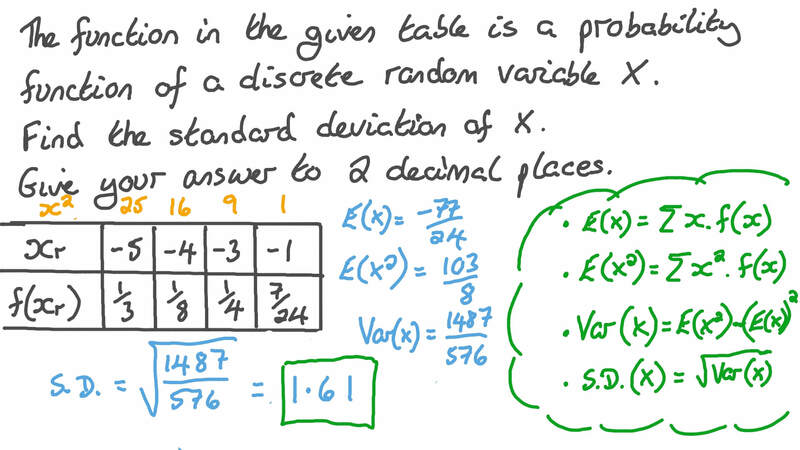 In this lesson, we will learn how to calculate the variance and standard deviation of a probability distribution. The function in the given table is a probability function of a discrete random variable 𝑋 . Find the standard deviation of 𝑋 . Give your answer to two decimal places. The function in the given table is a probability function of a discrete random variable 𝑋 . Given that the expected value of 𝑋 is 6.5, find the standard deviation of 𝑋 . Give your answer to two decimal places. The function in the given table is a probability function of a discrete random variable 𝑋 . Find the variance of 𝑋 . If necessary, give your answer to two decimal places. The function in the given table is a probability function of a discrete random variable 𝑋 . Given that the expected value of 𝑋 is 9 2 , find the variance of 𝑋 . Give your answer to two decimal places. 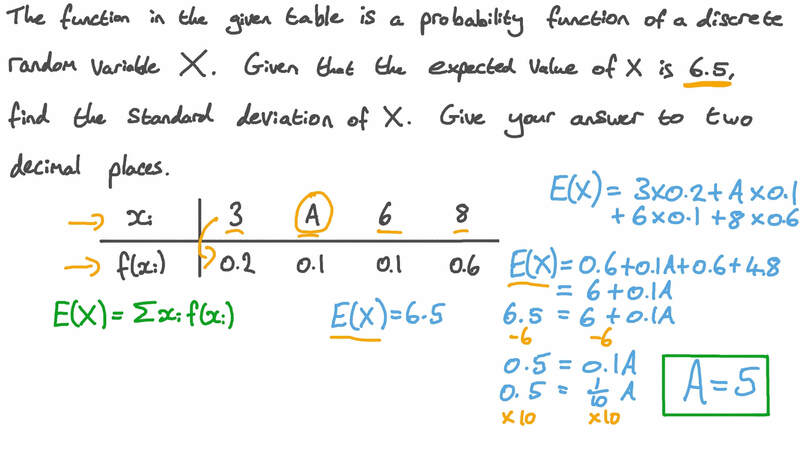 Can the function in the given table be a probability distribution function? A die is rolled two successive times. If the random variable 𝑋 denotes the sum of numbers appearing on the upper face after each roll, find the range of 𝑋 . Let 𝑋 denote a discrete random variable which can take the values 0 , 2 , 5 a n d . Given that 𝑋 has probability distribution function 𝑓 ( 𝑥 ) = 𝑎 6 𝑥 + 6 , find the standard deviation of 𝑋 . Give your answer to 2 decimal places. Let 𝑋 denote a discrete random variable which can take the values − 2 , − 1 , 𝑀 , 2 a n d . Given that 𝑋 has probability distribution function 𝑓 ( 𝑥 ) = 𝑥 + 4 1 6 , find the variance of 𝑋 . Let denote a discrete random variable which can take the values 2, 4, and 5. Given that has probability distribution function , find the variance of . If necessary, give your answer to two decimal places. Given that V a r ( 𝑋 ) = 2 8 , find V a r ( 4 𝑋 + 9 ) . Let 𝑋 denote a discrete random variable which can take the values − 2 , 2 , 4 5 a n d . Given that 𝑃 ( 𝑋 = − 2 ) = 0 . 1 5 , 𝑃 ( 𝑋 = 2 ) = 0 . 4 3 , and 𝑃 ( 𝑋 = 4 ) = 0 . 2 5 , find the value of 𝑃 ( 𝑋 > 2 ) . Let 𝑋 denote a discrete random variable which can take the values 3, 5, and 6. Which of the following functions could represent the probability function of 𝑋 ? 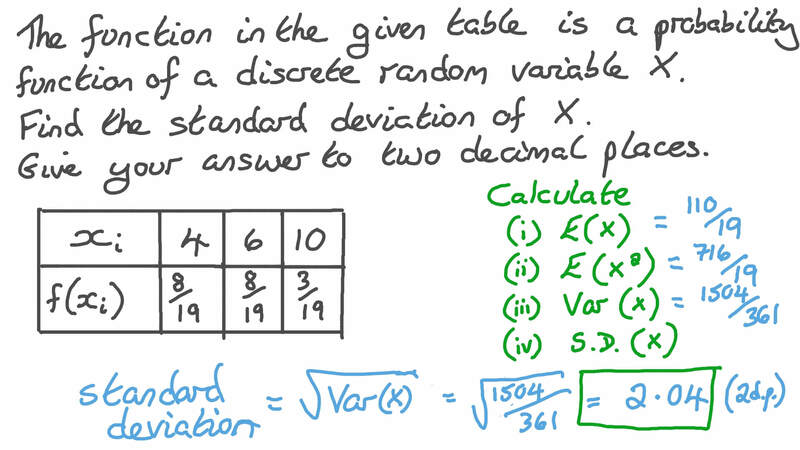 Which of the following is not a discrete random variable? AThe average height of children in a family. BThe number of children taller than 4 ft in a family. CThe number of children in a family. DThe number of cars in a family. Let 𝑋 denote a discrete random variable which can take the values 2, 6, 7, and 8. Given that 𝑃 ( 𝑋 = 2 ) = 𝑃 ( 𝑋 = 6 ) = 3 2 2 and 𝑃 ( 𝑋 = 7 ) = 4 1 1 , find 𝑃 ( 𝑋 = 8 ) . Give your answer as a fraction. Let 𝑋 denote a discrete random variable which can take the values 1 , 2 , 3 , 4 , 5 a n d . Given that 𝑋 has probability distribution function 𝑓 ( 𝑥 ) = 𝑎 + 𝑥 1 6 , find the value of 𝑎 . The function in the given table is a probability function of a discrete random variable 𝑋 . Find the value of 𝑎 . Let 𝑋 denote a discrete random variable which can take the values 1 , 2 , 3 4 a n d . Given that 𝑃 ( 𝑋 = 1 ) = 0 . 4 6 , 𝑃 ( 𝑋 = 2 ) = 0 . 1 8 , and 𝑃 ( 𝑋 = 3 ) = 0 . 1 4 , find the value of 𝑃 ( 𝑋 = 4 ) . Let 𝑋 denote a discrete random variable which can take the values 0, 1, 3, and 4. Given that 𝑃 ( 𝑥 = 0 ) = 𝑚 1 0 , 𝑃 ( 𝑥 = 1 ) = 𝑚 − 4 1 0 , 𝑃 ( 𝑥 = 3 ) = 9 𝑚 + 2 1 0 , and 𝑃 ( 𝑥 = 4 ) = 1 0 𝑚 + 3 1 0 , find the value of 𝑚 . Let 𝑋 denote a discrete random variable which can take the values 1, 2, 3, 4, 5, and 6. Given that 𝑋 has probability distribution function 𝑓 ( 𝑥 ) = 𝑎 𝑥 5 , find the value of 𝑎 . Let 𝑋 denote a discrete random variable which can take the values 1 , 𝑎 , 7 a n d . Given that 𝑋 has probability distribution function 𝑓 ( 𝑥 ) = 𝑥 + 2 1 8 , find the variance of 𝑋 . Give your answer to two decimal places. Let denote a discrete random variable which can take the values 3, 4, and 5. Given that , find the variance of . If necessary, give your answer to two decimal places. Let 𝑋 denote a discrete random variable which can take the values 2, 3, 5, and 8. Given that 𝑃 ( 𝑋 = 2 ) = 1 2 4 , 𝑃 ( 𝑋 = 3 ) = 5 1 2 , 𝑃 ( 𝑋 = 5 ) = 3 8 , and 𝑃 ( 𝑋 = 8 ) = 1 6 , find the variance of 𝑋 . Give your answer to two decimal places. Let 𝑋 denote a discrete random variable which can take the values 0 , 2 , 5 a n d . Given that 𝑋 has probability distribution function 𝑓 ( 𝑥 ) = 𝑎 6 𝑥 + 6 , find the variance of 𝑋 . Let 𝑋 denote a discrete random variable which can take the values 1, 2, 7, and 8. Given that 𝑃 ( 𝑋 = 1 ) = 8 3 , 𝑃 ( 𝑋 = 2 ) = 4 9 , and 𝑃 ( 𝑋 = 7 ) = 1 1 8 , find the variance of 𝑋 . Give your answer to two decimal places.